A resident of the Wood River Valley since 1995, Matt Luck has been a commercial fisherman in Alaska for four decades. 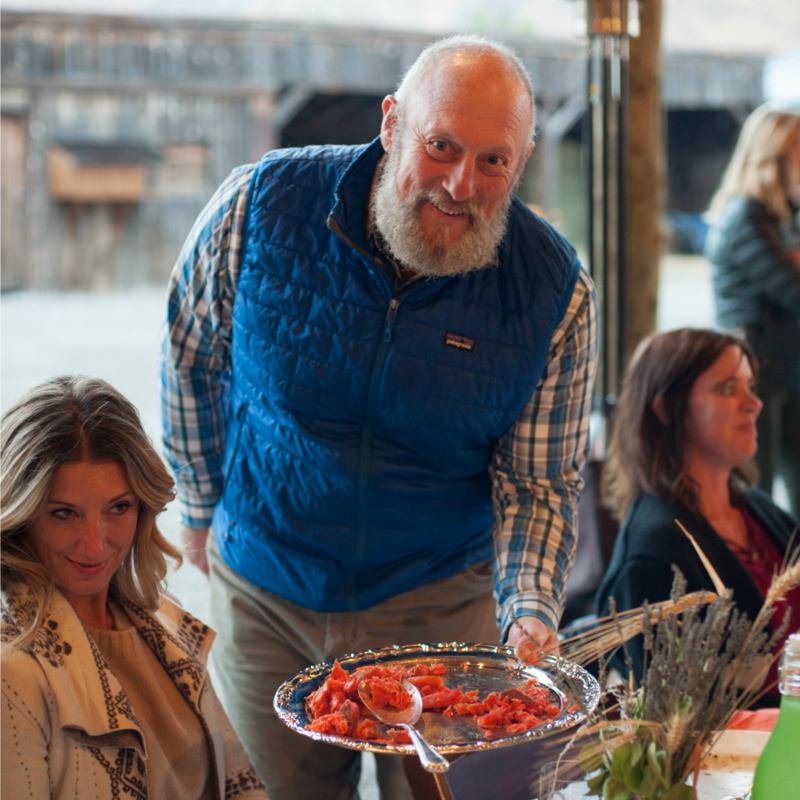 As founder and principal of Pride of Bristol Bay, his goal is to deliver the world’s finest, sustainable sockeye salmon directly to customers and he donates a portion of proceeds to Save Bristol Bay. Since 2011, he has been working to create a system that supplies high-quality wild, sustainable Alaskan salmon to consumers in the Wood River Valley and the Intermountain West. What drew you toward commercial fishing? I have been at the mercy of an adventure gene my entire life. At 20 years old, I headed to Alaska for the summer with two friends from New Hampshire to earn money for college. After one day working on a purse seiner in Prince William Sound, I simply knew that this was something that I would do for a long, long time. The people, the area and the lifestyle combined to create a place I wanted very much to call home. Everything. From day one, I felt like I discovered nirvana. I could work all day in places as beautiful as any mountain I’d ever been on and at the same time make a living. What makes Bristol Bay salmon special? The Bristol Bay sockeye fillets and portions we provide are produced by a 95-boat fleet of which I am a part. Every fisherman that is part of this fleet is held to quality standards at the point of harvest that are by far the strictest in Bristol Bay, if not all of Alaska. The result is a premium quality fresh-frozen product. Each of our individual vacuum-packed fillets and portions and the master case bear a code stamped on the packaging that calls out the fishing district in which it was harvested. This provides the consumer a level of traceability that is rarely found in the confusing landscape of today’s seafood retail sales regime. What makes your salmon “sustainable”? Bristol Bay is home to one of the world’s largest wild sustainable salmon runs. The 30-year average return to Bristol Bay is 30 million sockeye salmon. In 2015, over 50 million sockeye salmon returned to Bristol Bay, the third largest run in history. The Alaska Department of Fish and Game has developed a management regime in Bristol Bay allowing for commercial, sport and subsistence harvest that first and foremost assures enough fish make it to the spawning grounds to guarantee robust returns in the future. This spawning escapement first, all other uses second, is the foundation of the fisheries policy that makes the Bristol Bay salmon resource sustainable. Why do our seafood choices matter? It is important that we know, even demand, that our seafood choices are sourced from fisheries that are managed responsibly so that we support the health and continued productivity of our oceans. What is your vision for the future of seafood/fishing? Seafood in general is a proven source of good pure protein with a myriad of health and nutritional benefits. We need to recognize that, like water, this is a finite resource. I sincerely hope that we see global initiatives that address this basic issue and create policy that rewards sustainable fishery practices and seriously punishes those that overfish and pollute. What are you doing to change the status quo? I am donating a percentage of my pre-tax profit to resource advocacy in Bristol Bay and challenging other industry members to match that donation. By doing this, I hope to create an understanding that we, as stakeholders, need to support efforts to protect the core asset of Bristol Bay: clean, cold water and wild salmon. What’s your favorite way to eat and enjoy salmon? Blackened Sockeye Sashimi. Let a fillet thaw in the refrigerator, then skin the fillet, rub with Cajun seasoning, sear on both sides, 10-15 seconds per side in a very hot cast iron pan with a little olive oil, remove, slice and eat! Where can your salmon be purchased? Salmon lovers can visit our website and reserve a 20-pound case of fresh, frozen Wild Alaskan Sockeye Salmon fillets or portions to be picked up in the Wood River Valley. Wood River Sustainability Center (WRSC) in Hailey carries our salmon in the fall and winter as well. We also provide other premium Alaska seafood such as Spot Prawns, Halibut Cheeks, Bering Sea Cod and King Crab through a seafood share program in collaboration with WRSC.